Once Mitchell Kriegman announced a revival of '90s fashion icon Clarissa Explains It All in a sequel novel, fans dove head first into her new surroundings, basking in the familiar stories, diagrams, and stylings of the fascinating, all-too-familiar Clarissa Darling. To celebrate the sequel, and my favorite alternative era, Blue Pointe reissued the Clarissa Explains It All staff jacket this past holiday season. Now, I don't know about you, but I'm pretty stoked to be reliving my childhood as a 24-year-old working in Manhattan. The streets of midtown are a live-action showcase filled with mix-and-match patterns, strikingly bold lip stains, and a variety of denim. These trends, however, are all modern takes on the '90s fashions. Blue Pointe's dark denim accessory was originally crafted in the '90s. The most recent model was an identical twin, embodying the show's swag in every fiber from its high-quality embroidered back panel to its rolled-up sleeves. Channeling your inner listicle-making, crazy-clothes-wearing, super-girl-genius has never been so easy. The best part about Clarissa's jacket is the fact that it's customizable. Throw in the laundry a few times over for that wash-out denim wear or add a few patches for a personal touch. Clarissa represented self-expression, so why should her signature jacket offer anything but a blank canvas? The perfect purchase to gift (or keep! 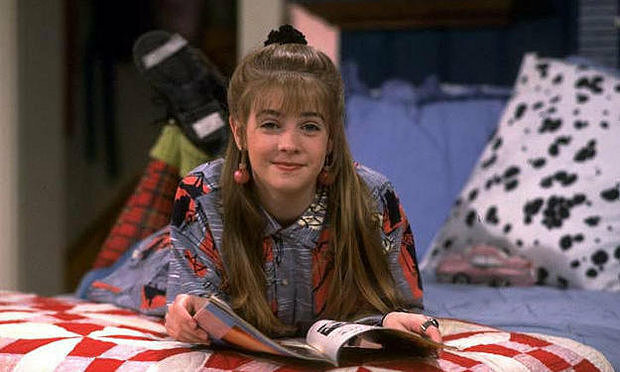 ), all Clarissa Explains It All memorabilia are ideal for the '90s kid. Want more Clarissa Explains It All? Check out these alternative buys that have me inspired to channel my inner Miss Darling in 2016. Even as adults we don't know much about what the future holds for us in 2016, but we do know that new year, new you calls for fresh gym tees. Snag this Clarissa Explains It All guinea tee from Look Human that is giving me all the nostalgic feels. Especially now that Nickelodeon brought back the fan-favorited sitcom, do you really watch the show if you don't have a tee shirt to prove it? A modern take on the '90s classic, slap a few patches on the sleeves or back of this blank denim canvas for a Clarissa-inspired style that will have you feeling nostalgic. Leggings are so last year. Swap the trend for an old-school option. Pair patterned, neon, multi-color, or contrasting tights with shorts, skorts, and skirts for a pop of color Clarissa would approve of. You can't possibly pay homage to the alternative era without embracing a few quirky accessories. Really, though, is there anything more '90s than a high pony perfectly centered on top of your head emerging from a puffy scrunchy? Answer: No.